Pain experts have theorized that immersing burn victims in a virtual world might help their recovery. The Shriners Hospital for Children in Galveston, Texas - a pediactric hospital specializing in burn care - is investigating whether or not videogames can help ease the pain of rehabilitative treatment for its patients. These efforts are part of an ongoing study, which has also included soldiers returning from Iraq. As burns heal, the area can tighten, which in turn limits the patients mobility. Special exercises can help with keeping the skin and muscles more flexible, but patients often report a lot of pain associated with the treatment. This is where David R. Patterson and Hunter Hoffman - a pain expert and director of the Virtual Reality Analgesia Research Center at the University of Washington, respectively - come in. They theorized that the introduction of a virtual reality world might help patients manage the pain more easily. 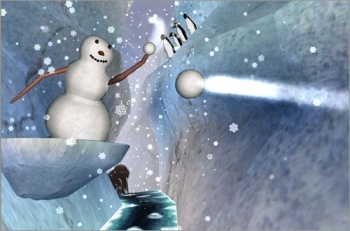 The game they created, called SnowWorld, is different from a standard videogame. It's not got much in the way of traditional gameplay elements, nor does it have a lot of characters to interact with. Instead, SnowWorld is designed to be a calming and immersive experience that gives patients something to focus on other than the treatment itself. The initial reports from the Shriners Hospital suggest that patients who have had SnowWorld incorporated into their treatment report less pain than before, and many began enjoying therapy sessions more than they had previously. The researchers are hoping to find that the use of SnowWorld results in more successful sessions, and therefore, greater mobility for patients.